Dolphins, sharks, penguins, rays, sea lions and more! Swimming with dolphins - amazing! And it all ends with a kiss! Sea Life Park is located on Oahu’s windward coast, about 30 minutes from Waikiki at scenic Makapuu Point. Get up close and personal with a fantastic array of marine life and make amazing discoveries about the inhabitants of our aquatic world. You can watch the performances or wade right in with the wildlife. Ever wondered what it’s like to be an animal trainer or an aquarist? Now you can find out in one of Sea Life Park’s special interactive programs. Stay dry or get wet, it’s up to you! Sea Life park was featured in the hit movie 50 First Dates! 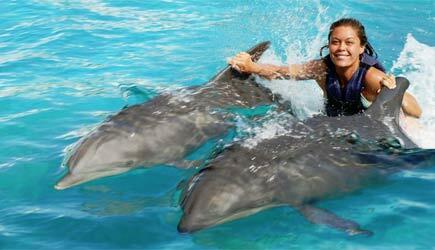 The Dolphin Swim Adventure is your chance to swim with dolphins. 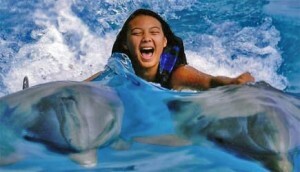 This interactive program gives you hands-on experience with dolphins. Watch them swim by you underwater while you snorkel, and have your picture taken with a dolphin giving you a kiss. Other interactions include grabbing on and getting a belly ride from a dolphin. You’ll feed them, get splashed, and in general just have a great time interacting with them and learning about their anatomy. Restrictions: Minimum age of participation is 8 and swimming ability is required. 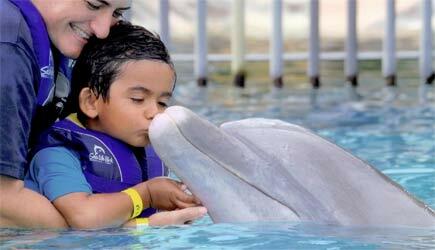 Children ages 8-12 must have an adult participating in the interaction with them in order to do the dolphin adventure (one adult per child 8-12). If no adult will be participating, children 8-12 should be booked on the dolphin encounter instead (see below). The Dolphin Royal Swim is the most extensive dolphin interaction Sea Life Park has ever offered, including more exhilarating activities … a behavior where two dolphins push the participant’s feet lifting you out of the water and giving you a thrilling ride across the pool. This is truly an experience of a lifetime. Schedule: The Dolphin Royal Swim is held daily at 9:30am, 11:00am, 1:45pm, and 3:15pm. Restrictions: Minimum age of participation is 8 and swimming ability is required. Children ages 8-12 must have an adult participating in the interaction with them in order to do the Dolphin Royal Swim (one adult per child 8-12). If no adult will be participating, children 8-12 should be booked on the Dolphin Encounter instead (see below). Learn about the intriguing world of dolphins … from a waist deep platform guests observe the dolphins while they perform high energy behaviors. Dolphins play and kiss and dance with participants! For those who feel comfortable, the program offers the opportunity to move off the platform into slightly deeper water. Schedule: The Dolphin Encounter is held daily at 10:15am, 11:45am, 1:00pm, and 2:30pm. Restrictions: Children ages 3-7 years old must be accompanied by a paying adult. All children under age 8 and/or less than 55″ tall must have an adult participating with them during the interaction (one adult per younger child required). This is a new interaction that allows participants to interact with dolphins close-up without getting in the water. Guests wear regular street clothes … no swim wear required. Go to a backstage pool where you will feed and pet dolphins and interact with them while they perform a variety of learned behaviors. 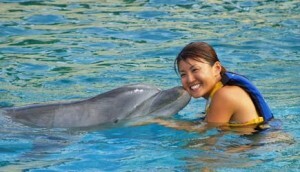 Schedule: Dolphin Aloha is held daily at 11:30am and 2:20pm. Restrictions: Children under 12 must be accompanied by an adult over the age of 18. (one adult per younger child required). Guests receive a unique opportunity to swim with a Sea Lion in a playful, educational, and interactive atmosphere. During the program, guests will be able to stroke a sea lion as the sea lion swims underwater. Guests will receive a performance and kiss from their sea lion! 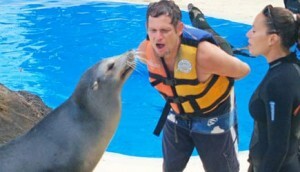 Act as a trainer and learn to communicate with the sea lion using hand signals. Photos available for purchase. Photos with your Sea Lion are available for purchase weather permitting. Schedule: The Sea Lion Swim is held daily at 10am and 11:30am. Restrictions: The minimum age for this interaction is 8, and children 8-12 must have an adult participating with them (one adult per participating child). Observers: Round trip transportation and park admission is complimentary for anyone participating in one of the interactions above. 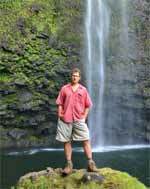 Additional guests who would like to go along as observers should be included in your reservation. 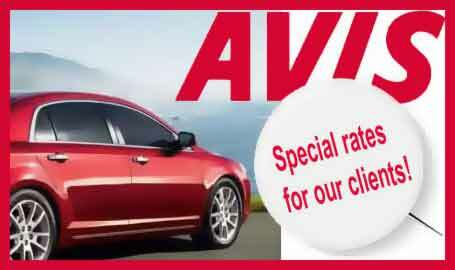 The rate includes admission and complimentary transportation to the park. Hawaiian Reef Encounter Add-on: This attraction is available as an add-on for those doing one of the interactions above. Guests swim in a special reef lagoon and meet curious Hawaiian rays face-to-face as they glide through the water. Using floatation vests snorkel and mask, participants can observe and interact with the rays. These graceful marine animals are gentle and friendly. This program is great for families and kids 4 years or older. Each child 4 – 7 years old must be closely monitored and accompanied in the water by a paying adult who is 18 years or older. Reservations: Advanced reservations for these interactive programs are a must. The dolphin adventures are so popular that they sometimes book up weeks in advance! Transportation: Round-trip transportation from Waikiki hotels to Sea Life Park is complimentary for those participating in interactive programs, as well as those who are paying for park admission and going as observers. Pickup times in Waikiki for morning interactions are between 8:30am and 9:00am and the shuttle returns between 3:00pm and 3:30pm. Pickup times in Waikiki for afternoon interactions are between 11:30am and 12:00pm and the shuttle returns between 5:00pm and 5:30pm. Tour includes: Price of interactive programs includes complimentary park admission for the participant. Parking: For those driving themselves to Sea Life Park, there is a nominal charge for parking. Restrictions: Pregnant women are not permitted to participate in any of the interactive programs EXCEPT for the Dolphin Aloha. Use only biodegradable sun lotion to protect the animals and their environment. To avoid dolphins from swallowing foreign objects, NO jewelry (including piercing jewelry) or anything that can potentially fall off in the water, such as sunglasses, glasses, rings, bracelets, necklaces, hair ties. Failure to comply may result in declining participation to the program. Note: Additional members of the party who are not participating in the interactive program will pay the basic admission price. 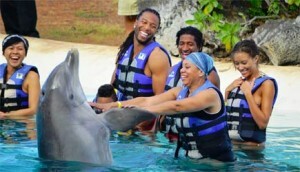 Photos: Photos with your dolphins and sea lion are available for purchase. Sea Life Park offers a LUAU on Sunday, Monday, Tuesday, Wednesday, and Friday evenings! See our Ka Moana Luau page for details and reservations. Coming on a cruise ship and just in Honolulu for the day? Sea Life Park doesn’t pick up at the Aloha Tower Marketplace where the cruise ship docks, but all is not lost. The best course of action is to book an early afternoon interaction and we’ll schedule the pick-up at the Hilton Hawaiian Village hotel. This is a fairly short cab ride from the cruise ship (about 15 minutes), and then you can grab the Sea Life Park shuttle for the rest of the way. On the return to Waikiki at the end of the day you’d be able to spend some time walking around Waikiki and then take a cab back to the cruise ship for your evening departure. Sea Life Park is open daily from 10:30am to 5pm. 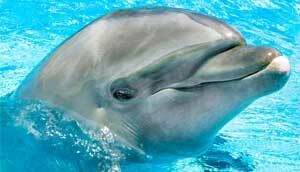 Their dolphin interactions are very popular and often sell out WEEKS in advance during the busiest time of year. If you are driving yourself to the park we recommend that you arrive shortly after the park opens and take time to enjoy the shows and attractions, and then do your interactive program in the afternoon. This way you’ll be dry while you walk around the park and you’ll be in the water during the heat of the day. Schedules do change occasionally but the current times for each event are listed above. If the time segment that you’ve selected is full, we’ll book you for the next closest interaction time. Check-in is 30 minutes prior to your interactive program. Most of our clients who rent cars just drive themselves to the park, which typically takes about 30 minutes from Waikiki, but it can take longer during peak traffic periods. If you don’t have a car, the park’s shuttle will take you there from Waikiki. The shuttle transfer to the park is included in your rate if you are doing the Dolphin Swim Adventure, Dolphin Royal Swim, or Dolphin Encounter. Morning interactions have a Waikiki pickup between 8:30am and 9:00am. Afternoon interactions have a pickup time between 11:30pm and 12:00pm. These times are approximate because the exact time varies from hotel to hotel. Your email confirmation will tell you the precise time and place of pick-up. No advanced reservations are needed for ADMISSION ONLY to Sea Life Park … but you DO need advanced reservations for any of the programs listed on this page!! !